Diarrhea is a sudden onset of loose stools that are watery and at times can contain heavy amounts of mucus due to intestinal infection. Hookworms, tapeworms or whipworms when present in the intestines of the dogs, can damage its walls resulting in bloody stools. 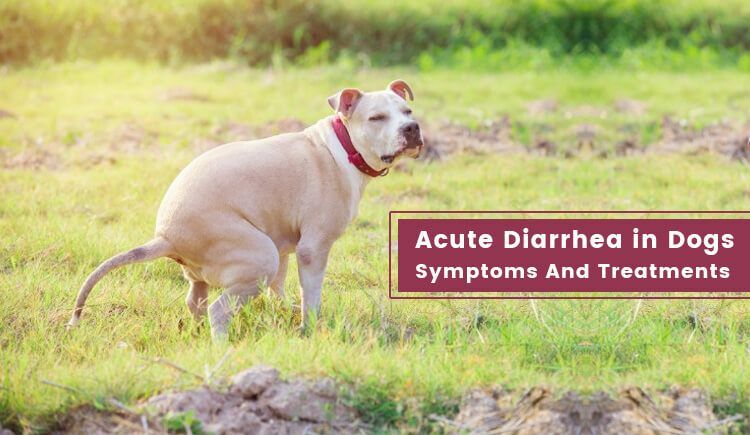 Other very common reasons for diarrhea in dogs are – an excessive amount of water in the food or high amount of food in the intestines which leads to excess secretion of water into the intestines. Diarrhea causes pH imbalances and also disturbs the electrolytic function thereby causing mild to extreme dehydration in canines. How Is Diarrhoea Diagnosed In Dogs? A complete faecal analysis is done to understand the underlying reason. Abdominal radiographs are performed and the complete biochemical profile is studied after taking a blood test of the affected dog. Histopathologic examinations like endoscopy may also be done to check for parasites. A severely dehydrated dog is hospitalized for fluid retention therapy and electrolyte therapy. Antibiotics or deworming tablets may also be administered to eliminate any parasitic infection which had caused diarrhea. Easily digestible bland diet is provided to the dog to relieve the intestines of pressure. Diarrhea can be easily prevented by providing rehydrating solutions and optimum water. Ensure your pet is on regular wormers so as to prevent worm development. Do not let him eat any kind of spoiled food as it causes food poisoning in dogs. Strictly avoid him from having feces of other animals. Do not give him processed food. Some dogs may be allergic to beef, carrots or any food item which may lead to vomiting and diarrhea in them. Substitute those allergic foods with other natural foods. Diarrhea can be severely dehydrating and debilitating for dogs. Therefore, if the condition persists for more than a day, consult the vet without further delay. Moreover, you must always keep a check on your pet’s stools because their consistency will change if the dog is infected with any kind of parasite. Your pet’s health is in your hand, so make sure you fulfill your responsibility diligently.